Bottle & keg; Seasonal - Autumn (but available year round in bottle). We wanted to harness the evocative sense of the Somerset Autumn in a beer. 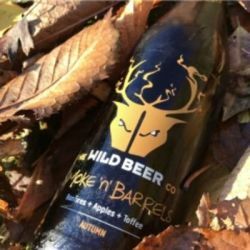 With the last apple pressing days, dry leaves underfoot and the whiff of bonfires at every corner this beer sums it up, from sweet smoke, warming malt sweetness and hints of apple. This is a beer to drink post barbecue, scarfs on, stomping against the chill and watching fireworks on a starry night sky. Tasting with Višnja 666, September 2017. Bottle. Dark amber to light chestnut colour, small to a medium off-white head. Very odd aromas - smoky, also apple, light vanilla, dried fruits, caramel. Sweet. Medium body, moderate carbonation, alcohol hidden, drinkable, light to moderate finish. Very interesting use of smoke and spice. Bottle. Smoked Christmas apples with a toffee topping, slightly more sweet than full, light tart. Very tasty dessert beer. Bottle from Radbeer. Pours an amber-ish brown. Thin, very off-white head that fades fairly quickly. Aroma has an initial waft of smoke. Lapsang Souchong. Just a hint of something a little medicinal......Germolene or summat? Earthy spice. Toffee malt. Gala apple peel. It's a little muted overall here but the profiles are present. Taste has a little Soreen malted sweetness. Almost Belgian-esque yeasty notes. Some background smoke. The sweetness from the lactose fills out the middle with a little tang from the apple juice balancing this out by the finish. Mediumweight mouthfeel. Wish there was a touch more body. Lightish carbonation. It's an interesting brew and pleasant enough to drink but it could do with a little more oomph. Got this on day 21 if the Beer Gonzo advent calendar. I’d probably never have chosen this myself, but like it a lot. Ruby brown, clear and shiny, with a small and brief off-white head. Medium body. Great smoky nose with hints of apple and toffee. Taste has sweet toffee malt, red apple and woody smoke. barwa brunatna, piana skąpa. Aromat intensywny, ogniskowa wędzonka, karmel, toffi i owoce w tle. W smaku lekko słodkie, wedzonka, karme, krówki, jabłka. Finisz to niska goryczka. W aromacie sporo dymnej wędzonki, bardzo czysty profil podbudowany karmelem i lekkimi nutami owocowymi. W smaku już nie tak bogato, lekko dymnie, wytrawnie, jest lekko owocowy posmak i karmelowość. Troszeczkę zbyt oszczędne, gdyby dodatki były bardziej wyraziste to byłoby interesujące ufo.